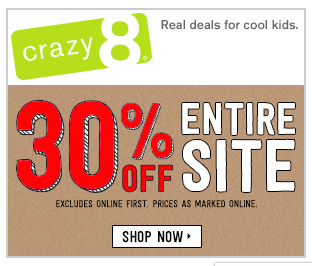 The Crazy 8 Black Friday Sale is HERE and they are offering up 30% off their ENTIRE site!!!! These are some of the deepest discounts and best prices of the whole year!!! 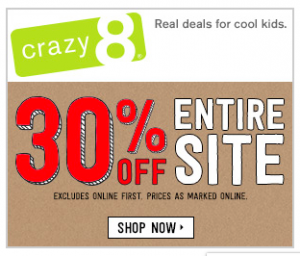 Get 40% off your entire purchase, plus free shipping at Crazy 8, while supplies last. Starting on November 24- November 28, While supplies last.